Dina Kowal Creative: Our Daily Bread designs - February blog hop! Our Daily Bread designs - February blog hop! I love it when I get to hang out with the Our Daily Bread design team! Today they are showcasing the new releases for February in a blog hop. If you're a regular reader of my blog and just happened upon my section of the hop, you may want to start back at the beginning. Prizes are involved!! The ODBD Blog is the place to get started - actually you'll start and end the hop there, and if you should happen to get lost or interrupted in between, you can always go there for a complete list of links in the correct order. If you came to my blog from Dawn's blog, you are doing just fine. When you see me playing along, you know that I've had a part in the new release...... this month, this set is my contribution! This set is special to me, because I drew the image instead of working with a vintage or photo image..... I just couldn't find the picture that was in my head! It took a little courage to put my drawing 'out there' but I hope that the image with its accompanying verses and quotes will be an encouragement to many. I struggle with fear and anxiety, and find it such a comfort to return to the fact, as it says in Hebrews 6, that God never changes - even in the midst of trials and uncertainty we can be sure that His promises are true and that His love always surrounds us. I colored the focal image on my card with Prismacolor pencils - the colors I used are listed below. For the most part (except for the water) I blended the colors together with light-shaded pencils instead of using odorless mineral spirits. I stamped the Wood background on the sentiment panel and sponged the edges. The other cardstocks I used were from Basic Grey. Lace was a local find. This is an easel card, so here's the inside panel - the two-part sentiment can be used on the front and inside like this, or stamped together. The anchor was stamped lightly in the corner of the panel and sponged. I always score the edges of my panels with my Score-Pal, just for a more finished look. The raised edge inside helps the front of the easel card stay standing. These are the pencils I used to color the main image: On to the hop details: The Hop will run from 8am eastern Feb. 1 until 8pm Feb. 2. Winners will be announced on the ODBD Blog on Feb. 3rd, along with Sandee’s fabulous Time With Project! Kelley is giving away SIX prizes this month! FIVE people will win one Fish Single Stamp of their choice, and ONE blessed person will win the FEBRUARY BREAD BASKET BUNDLE! * Return to the ODBD Blog, answer the question they've posted for you, and tell us you completed the hop, letting us know if there were any blogs you could not comment on. You'll be moving on from here to Betty's blog, Stamping to the Wright! I know you'll love what she's cooked up - Betty does beautiful work! P.S. If you don't see your comment post right away, don't worry... it's there... I screen my comments, and since I'm probably on the other side of the world from you, it's sleepy time for me... and I will click your comment through when I'm awake! Dina, this is beautiful! You drew the image - wow! You are one talented lady! I love it! The card is beautiful and the coloring with pencils is so soft and pretty. Great job! Absolutely beautiful easel card, Dina! What a beautiful Card... the whole thing is just beautiful, colors, papers, idea.... just everything... Great Job! You did a fabulous job drawing this image, which is sure to be used time and time again by others. Your card is absolutely gorgeous! So serene!! I love your coloring of the image!! Beautiful stamp set!!! Love the way that you created the easel card...simply stunning! Thanks for sharing your talents. Oh Dina I'm so glad you joined us on this hop! Your card is incredible! LOVE the easel card and the softness of your blending of the pencils! Love the anchor on the lower panel and LOVE the wood bg on white! I pulled that out yesterday too... it's a perfect companion! This is gorgeous my friend!!! Thanks for another GREAT set too! Dina your card is so beautiful! I really love the inside of your easel card. and the coloring is wonderful. Dina I have to tell you that I love this set and what you have done with it is stunning! Beautiful card. I love how you used the colors - they're so lifelike and natural. i love the subtlties of this card. it's so soft. WOW. This is just the most amazing image!!! I just adore it! Your work is amazing as always!!! I love that your card looks dreamy and wispy. The softness is lovely. It is hard to keep that delicate balance throughout the whole card...but you accomplished that. I love this card it is amazing. Dina, what a lovely card. When I look at this card, I feel peaceful, with the soft colors. Thank you for sharing. Beautiful card. I love the subtle colors and the easel looks great! I love your card and great coloring with the pencils. I thought it was watercolor. Wow, very soft and beautiful. The card doesn't even looked stamped!!! This is stunning Dina!! I just love your soft coloring of the image and your sponging. What a gorgeous easel card!! Love this set!! You did a beautiful job designing it my friend. Beautiful card and great stamp set! Thud. I can't take my eyes off of your card. Thank you for sharing the colours and technique you used. I'm so into working with Prismacolor and will try shading with pencil. Very unique. Your image looks like an artist painting. Beautiful! Love the sutle colors you used! I love the subtle colours. It reminds me that the storm will pass. Beautiful image (congrats!) and a gorgeous card. The easel card design is ideal for the outside-continued-inside sentiment. TFS your many talents. I like how the sentiment is a two-parter. Your colouring is gorgeous. Thank you, thank you, thank you for helping make this set available. Lots of possibilities. And, Your card is stunning! Dina, what a calm, uplifting card! The soft colors help instill a sense of God's peace. Thank you! This is beautiful!!!! I just love the softness of it. Thank you so much for sharing! Wonderful easel card. Love the colors. Thanks for sharing. So beautiful. It's so much fun to see how each of you uses the same stamps. Love the lace touch! I so love easel cards, they allow everyone to see the whole thing without invading a "private space". I am one to display my cards and this is a very important part. Your card is so soft and light and focus's on the sentiment. Beautiful! Thanks for sharing! So, so calming and beautiful. I must get this set. Our pastor is preaching on fear right now, and this image and the sentiments are perfect. Your card is amazing. TFS! I love your use of Lace in this! Great card. This is beautiful. I love the soft, delicate look of your image. It's like a cloudy day at sea! And, I love how you made it into an easel card. You drew this??? I am impressed! The whole stamp set is just beautiful and such a great expression of faith! I am amazed. I love the colors you used for your card. I'm also going to use your idea of scoring the edges of your card to give it a finished look. Very nice! Looks like a muted photograph. Very pretty! I love the softness of this and how you carried it to the inside of your card. TFS! Oh how simply Gorgeous!! Your talent is amazing. Thank you for sharing with all of us. I love the tip about using the Scor Pal to finish the edges. Beautiful coloring - love the soft look you've created! Wow, this is amazing! I know you're a very talented lady having designed this stamp set and drawn the image by hand! You're card is beautiful, it doesn't even look like its stamped, it looks like you've hand draw and coloured it! What ink did you use to stamp? Dina, this is so wonderful. I love the colored pencils, what a soft and pleasant look it gives to the image! Love the softness of your beautifully done easel card. Safe travels. What a fabulous card. I love the anchor image. Your whole set is very inspirationa. Thanks so much for (drawing) and designing this gorgeous set! What a powerful set! Your sample is amazing too!!! So good that you could join our hop today! God Bless!!! Wow your a great designer! I noticed a touch of red on the anchor...then I looked at the colors you used...and there was a reddish color! Couldn't help but think of our Anchor's blood poured out for us. Thanks! Dina - Your design is exceptional and your card is awesome. The Lord has given you a great talent and thanks for using it for his glory. Thanks for sharing your talent with all of us. Wonderful, Dina! I love the soft colors and fabulous layout. Awesome set! Beautiful, soft, ooooooo I like your coloring ( and your drawing -great job). Amazing card! Your coloring skills are incredible and your drawing skills too! Thanks for creating such an awesome stamp set for us! The subtle coloring and layering of this card are so perfect with the beach! I love this set and you did a wonderful job drawing the image. Your card is beautiful, it is so soft and this is the perfect card for an easel card. God has given you an amazing talent in your ability to draw like that! It is a gorgeous card! Dina, your pencil work is always so inspiring! Thank you so much for drawing this design Im sure it is one to be used over and over again.It has my vote. I love how you decided to show case this I must try it this week. What a beautiful card! Awesome job! Dina, what a wonderful set for ODBD; you did a great job bringing this to the "world" for all to see/use. Great card too; love all the details. Thanks for sharing. So unique. What a lovely card! Thank you, Dina for sharing the gifts and talents the Lord has given you. The new release is a work of art and so honoring to our Great God and King. . . and your card and pencil work are awesome. Beautiful work, my dear! Blessings in Christ! "Janaria" Jan E.
Your card is just beautiful Love it!! Dina, your courage is rewarded. The anchor graphic is perfect! And your card......WOW! and WOW! again. I'll be coming back here for inspiration, I'm sure! I love the softness of this card. The easel style is just perfect. What an inspiration. I need that set! Oh My Word, can you color or what. You made this look so life like its amazing. The shading is wonderful. Beautiful card. Such soft colors for such a powerful message! Love the card!! Love the design and the colors. Wow! You definately have a talent! This is just gorgeous! Your anchor drawing is beautiful. So glad you decided to go for it and draw it free-style, using your own creativity. The verses are very comforting and work so well with the image. You did that shading with just layers of colored pencils, no OMS? Wow! Dina! This is just sooo amazingly stunning! I so love the softness to your card, your coloring is perfect too! Thank you so much for all your wonderful sets! I love them all! :) Hugs!! Stunning card Dini and this set is just amazing!! Fabulous coloring!! So glad you could join in! Your design is wonderful. I love the precious sentiments that are in the set as well. You are a very talented lady, thank you for sharing your gift with us! So nice to see the use of the Prisma pencils. Seems like that technique has gone astray. Now I'll get mine out and use them again. Dina, you have been gifted with a wonderful talent for drawing and creating! I love your use of the easel card, your choice of colors- everything. Gosh, that's a gorgeous card!!! Thanks for sharing how you colored it. It's so professional looking! This is really stunning. Your colouring is beautiful. I love the colpours you have chosen. There is a calmness about the card which makes you stop! How utterly and completely perfect!! Everything about it makes it so lovely!! Your card is just beautiful!!! I love the soft colors. It would be beautiful as the top of a jewelry or keepsake box! What a beautiful card! I love how soft it looks! inviting card I have ever seen!!. What a difference when using the pencils!!! Thanks so much for sharing your talent!!!!! It is so soft , warm and inviting. I forgot how nice the pencils are. Thanks so much for sharing your talent and creativity!!! Thank you so much for creating this set and being brave enough to share it with us. It's beautifully done, and your treatment of it looks like a framable watercolour -lovely. This is so soft and beautiful. Your card is gorgeous! You did a fantastic job of coloring your card, so soothing to look at! Great card! I love the soft colors that you used. Your pencil skills are great as usual. All the cards have been good, your design is great. This is truly a work of art! The pencils add such a softness to the whole card. Lovely to look at, soothing, yet...elegant! This card is beautiful and the coloring with pencils is awesome!!! I don't know why you would be anxious about putting your artwork out there, you are a very talented lady Dina. Your card is beautiful, so soft and inviting to the eye. Dina this is exactly the way I see this beautiful image in my head but don't know how to get it onto a card! I always love the sets you create and all of your cards are beautiful! so, so pretty. Love your coloring! I absolutly love this set!!!! You did an awesome job on it!!!!! love your card too! This card is so nice, great work! Congratulations on another beautiful and encouraging set! Your card is gorgeous! Beautiful card and I love your drawing! wow, you are so talented - a great eye for color too. i have loved what each lady has done with this set of stamps. I love the picture in this stamp set and of course the verses are so appreciated. Thanks for putting yourself out there for us! Beautiful..love the soft misty look and wonderful easel card. What lovely subtle colors allows the sentiment to hold center stage. WOW!! I love this card! I love the color and design!! My favorite! Thanks for sharing! Your "baby" is a wonderful one! I have fallen in love with this stamp set as I have been following each new design. It is amazing to see what can be done with it and it works for so many occasions. Your card is beautifully done as well. My men would love this card. Love your easel card - very pretty! The stamp set is stunning and the color pencils make it so soft and beautiful. Thank you! I particularly love the sense of peace this card projects. I love the soft subtle colors you used on your card! I am also loving this anchor image you created!! Just beautiful. The sentiment is so true! I love this card, it's just beautiful!! Your coloring is just amazing!!! What a lovely soft treatment of this stamp! Thanks for sharing. Loved everything about this card. Lovely. Your coloring is phenomenal. Wonderful stamp set and Beautiful Card. I love your coloring, the softness to the colors, the backgrounds, dp & lace, it all came together very nice. Your card is gorgeous and I love the stamp saying. Alright, alright already you guys...I'm going to buy the set! Sheesh! LOL! I love your card Dina! Dini, you are indeed a wonderful artist and designer. Be proud of your picture - it is worthy! I love your card, and your color choice is so muted but awesome! Dina, THANK YOU for creating such a BEAUTIFUL set!! Your coloring with Prismacolor pencils is out of this world!! TEACH ME your secrets!! Can't wait to see more of your gorgeous stamp creations in the future! Beautiful card. Love the soft look the pencils gave it. That is one of my favorite mediums. THIS CARD IS SO CALM AND SOOTHING. JOB WELL DONE. Wow, you easel card is fabulous. Love the coloring and calmness of it. Beautiful Card. Thank you for shareing. First of all thank you for the wonderful image. The card you have made is just so beautiful how could anyone not feel at peace when they receive it. I like the easel style as then both parts of the verse can be seen and the continued image. A totally beautiful card. You have designed a wonderful stamp and have done such a dreamy looking card. I just love the softness to this card. So pretty! Great job with this card! Beautiful card love the coloring. Great image and wonderful easel card. Absolutely gorgeous card and your drawing is awesome. Very, very well done! Loved the softness of this card. It is beautiful. GORGEOUS coloring and beautiful design, Dina! Lovely card. Great job coloring your image. WOW! What can I say! THANK YOU! I love your creation!!! the lace adds such a soft touch to the card...gorgeous. such talented lady you are. You designed this stamp set??? It's gorgeous. Thank you for sharing your talent. The soft colours in this made me relax while looking at it. How beautiful. Thanks for what you do. Your coloring on this card is amazing and the lace just enhances your image with almost a draped net like look. Love the the reflective look of the inside. Beautiful card. Wow! I can't imagine having the gift of drawing the stamps for Our Daily Bread Designs. They are the best stamps anywhere! This set is beautiful. 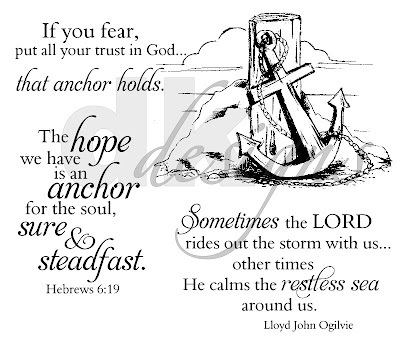 I love the rock behind the anchor, and the Scriptures that are used give such comfort, as does that wonderful quote. I really like the way your card came out! I like how it is muted. And, the beautiful way you can see the wood on the post, and the beautiful lace reminds me of the foam that comes to the edge of the ocean and the beginning of the sand. Just beautiful. It was a pleasure to visit your blog! I love the softness of your card, the coloring of the image and the lace lend a tranquil touch to the card. Love the grey shades, very nice. TFS! It's 5:08 here PST and 8:08 EST, hope I get to finish the hop, thanks! So soft and so beautiful, you achieved a unique look all your own with this set. Dina, Use of grey dramatic repeat of a most strengthening image reminding all of us from Whom comes our breath. ODBD honors FATHER once again. Blessings in your comings and goings this day. Dina, you did such an amazing job with this image. Truly. I am in awe of your talent. Thank you for blessing others with the gifts God has given you. Dina, your card is absolutely gorgeous. You colored it so beautifully...just a delicate hint of such relaxing, peaceful colors. I missed the hop, but I still wanted to leave my comment that your image and your card have been a bright spot in my day! Blessings!